Rick has been associated with Federation University Australia since 2000 and has been a part-time lecturer during that time. Has been in collaboration with CeRDI since 2015 and has worked with the state government in many roles since 1972. 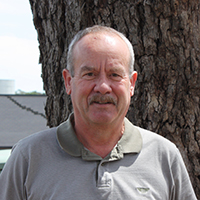 Rick completed a Graduate Diploma in Land Rehabilitation in 1998 at the University of Ballarat. Rick has extensive expertise in Geographic Information Systems and GPS and has worked with these technologies since their first appearance in Victoria. Rick has been the developer of many applications, some being, turn key GIS applications for ESSO Australia, Keep Australia Beautiful and the Woady Yaloak Catchment Group. Rick has a close working relationship with local government, the spatial industry as well as Landcare networks in Victoria, Queensland and Western Australia. In his role in government and as a volunteer, Rich has proven skills in engaging stakeholders, collaboration and project management. Jackson, B., Pope, R., Carlin, J., Nolan, T., Land, D. (1997) The Role of GIS in Health Care Planning & Analysis, paper presented to 25th AURISA Conference, Information Change- Back to the Future held from 17th to 21st November, Christchurch, New Zealand. Pope, R., MacEwan, R. & Davidson, A. (1997) Catchment and Whole Farm Management Requirements for a Fully Integrated Low Cost GIS, presented at Landcare Changing Australia, National Conference, September, 1997. Jackson, B., Pope, R., Carlin, J., Nolan, T. (1997) The Role of GIS in Health Care Planning & Analysis, GIS and Health Symposium, http://www.sli.unimelb.edu.au, University of Melbourne. Prevett, P., Pope, R., Callaghan, J. & Bailey, L., (1997), The Koala Habitat Atlas: Preliminary Results for Koala Tree Species Preferences in the City of Ballarat Local Government Area, Victoria, paper presented at Central Queensland University, Emerald, Qld. Carter, J., Jackson, B., Pope, R. & Reid, P. (1996) Integrating GIS into the Victorian Police Force, paper presented to 24th International Conference and Technical Exposition of the Australasian Urban and Regional Information System Association (AURISA) Conference held from 25th to 29th November, at the Wrest Point Casino, Hobart. Pope, R. & Lawrence, J. (1996) GIS Data Integration, paper presented to Local Links Conference, Melbourne, 8-12 May, 1996. Prevett, P., Smithyman, S., Pope, R. & Schlagloth, R. (1995) Interaction between Koalas and Roads on The Midland Highway and Western Freeway in Victoria, Report to the Australian Koala Foundation, Brisbane, University of Ballarat. Prevett, P., Pope, R., Smithyman, S. & Hives, N. (1994) Koala Road Mortality: An Application of a Geographic Information System to Koala Conservation in Victoria, Proceedings from the Australian Koala Foundation: Brisbane and Networks Conference, Geraldton, Perth, WA. Smithyman, S., Prevett, P. & Pope, R. (1994), Ballarat Regional Koala Database Reference Guide, University of Ballarat. Prevett, P., Pope, R. & Smithyman, S. (1993) Koala Road Deaths: Characteristics of Black Spots and Koala Protection on Freeways in Predominantly Agricultural and Grazing Landscape in Victoria, Proceedings from the Australian Wildlife Management Society, Dec. 1993. Prevett, P., Pope, R. & Smithyman, S. (1993) Koala Blackspots on Major Highways in Victoria: An Application of GIS, Proceedings from the Ecological Society of Australia, Canberra, October 1993. Richardson, R. & Pope, R. W. (1989), Towards and automated Cadastral Survey and Drafting System, Proceedings from the 31st Australian Survey Congress, The Institution of Engineering and Mining Surveyors, Australia Inc., Hobart, pp. 195-217.